Question: Deseq's plotMA color-coding at random? EDIT: Just had to order the data frame by adjusted p-value before plotting! I'm leaving this up in case someone runs into a similar problem. 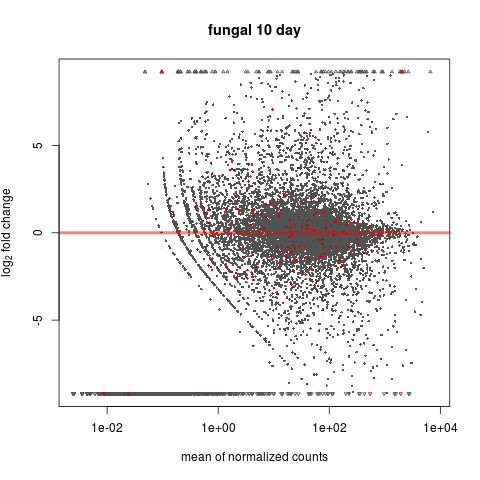 The same happens with every pairwise comparison (four time points, maize counts compared to water inoculation, fungal counts compared to a single axenic sample). I'm trying again in DESeq2, but I'd like to know what's going on, if anyone has any pointers. 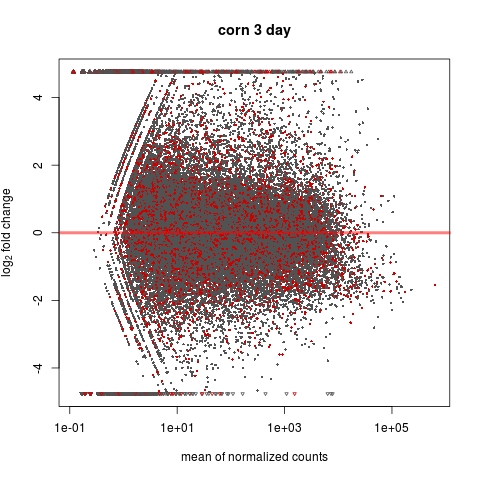 It ended up just being something similar- the data had to be ordered by p-value before the color scheme worked out. Thank you for the advice! it looks like there's a single line in the plotMA function which puts the col and x,y out of order. I've emailed the maintainer. subsetting res[res$baseMean > 1,] should be a fix for now. As mentioned above, this is likely due to a bug in how subsetting is performed. Both of these solutions worked for me.